Photo © Judd Patterson, used by permission. Description: Another black-legged, black-billed, sparrow-sized sandpiper, Baird’s Sandpipers show strong demarcation between a white belly and heavily streaked breast. There are no markings on the sides. The wing tips extend beyond the tail. They commonly forage in small flocks or as single birds in dry, vegetated areas around wetlands. 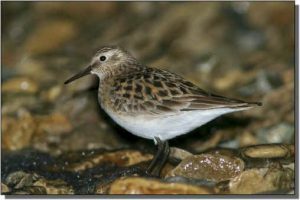 Similar Species: A challenging “peep,”Baird’s can be distinguished from Semipalmated and Western sandpipers because their wingtips extend beyond the length of the tail. White-rumped Sandpipers are also long-winged, but lack the strong demarcation between belly and breast. With markings on the sides, White-rumped Sandpipers are less buffycolored and have a prominent supercilium and white rump. Baird’s also appear “squattier” than these other three species. Pectoral Sandpipers are larger with yellow legs. Comments: Baird’s tend to be early spring and fall migrants in the Great Plains. They are dry coastal and alpine tundra nesters and winter along beaches and mudflats in southern South America.